You might remember the camelias from my Monday walk post? I thought I should finish that lovely day off, whilst it’s still in my head. And those darned March Squares– there’s just no getting away from them, is there? If you drive up the N266 towards Monchique, from the coast, you will pass the sign for the thermal spa, Caldas de Monchique. It’s easier to turn off on the way up, but be warned- you mighty dally there longer than you had planned. You also need to like gradients, but if you just want a flavour of the place you don’t have to climb much. Set at the bottom of a valley, it’s in a world all of its own. Better in Spring, the season of wistfulness here on the serra, because in Summer the spa becomes a popular place. The path drops down to the main buildings, or you can follow a series of woodland paths, in and around the boulders. The fonte chuckles to itself and, even on a not-so-sunny day, families will be having picnics at the shady benches provided. 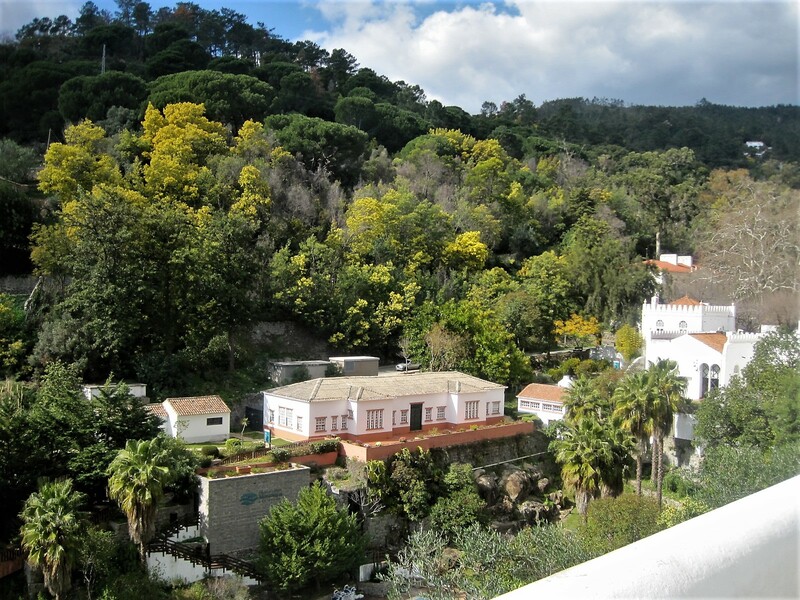 Caldas de Monchique was a spa even in Roman times, and was once popular with Portuguese royalty. The springs (caldas means ‘hot’) are at a temperature of 32C, and are used as a curative for rheumatism and respiratory problems. The water from some of the springs is bottled. The combination of Moorish styled main buildings and more rustic dwellings, in such a setting, seems to lend an element of fairytale. It’s one that appeals to me very much. I hope you like it too. The storks? If you remember, they line the roadside on the way to Monchique. These are just two of many. Where would I rather be? asks Krista. Well, it’s not a hard question, is it? She actually left me and another lady who couldn’t keep up. The next holiday we had we went everywhere by ourselves and had a great time. I went there last year and absolutely loved it. So beautiful and I loved the stork nests too.